Eidford at first light. Rolling mountains stand black and massive on both sides, reflected on the glass-calm, silver sheen of the fjord. On the shore, cars scurry in and out of granite tunnels like tiny beetles. Small boats sit tethered to the rocky edges like flies frozen in amber. Ahead, a sea of lush green meadows stretches as far as the eye can see. From the shore, Marco Polo looks like some trim, tidy work of abstract art, improbable and yet undeniably real. The small, perfectly-formed ship is obviously the product of another place and time. Smoke curls lazily from her single funnel. The sharp, raked bow and the slightly upturned stern make the ship look like a long, lazy smile. The superstructure is low, snow white, and balcony-free. The almost church-like early morning silence is bruised by the bustle and splutter of the first tenders, transporting excursion passengers. From my table on the aft terraces of the Marco Polo, I pick at fresh croissants and coffee, and realise it’s time to go ashore. Eidfjord was the first stop on an eight-day, high summer cruise to the Norwegian fjords from London’s port of Tilbury. Marco Polo is a million miles removed from the modern, state-of-the-art floating resorts that populate these same waters each summer. A major difference is that none of our 800 passengers were children. Marco Polo is an adults only ship. At just 22,000 tons , this small, intimate gem simply lacks the facilities. No, our passengers are very much an older, all-British crowd. People who like sailing on a well run, comfortable ship at a reasonable price, without the hassle involved in passing through airports. For them, the size and easy accessibility that a ship like Marco Polo provides make for a far easier, gentler kind of summer holiday. The cruise was completely full. Built in 1965 as a Russian liner named the Alexsandr Pushkin, the ship ran for many years on the Leningrad to Montreal run. In 1991, Gerry Herrod bought the vessel for his nascent Orient Lines. In his own words, the entire ship was gutted ‘like an avocado’. Only the original engines and the specially ice-strengthened hull remained. The rebuilt Marco Polo soon gained a reputation for elegant, adventurous expedition cruising. With a series of new, curved terraces added to her stern, embracing an outdoor buffet and a new, larger pool, the ship was redecorated in bow-to-stern Art Deco. Painted, stained glass ceilings, steel and leather bar stools and elegant Balinese statuary gave the ship a rich, raffish feel. 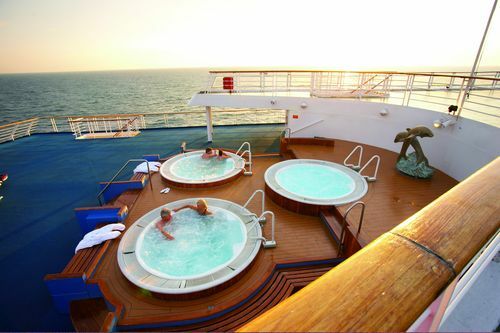 A trio of upper deck hot tubs provided arguably the best overall vistas on any ship afloat. They still do. My upper deck cabin featured a pair of fixed single beds, a plasma screen television that I never once got to watch, more than enough wardrobe and drawer space, and a powerful shower. The wardrobe area also contains a small safe, but there are no tea and coffee making facilities. With a couple of decent-sized picture windows, this room was a comfortable little home away from home. 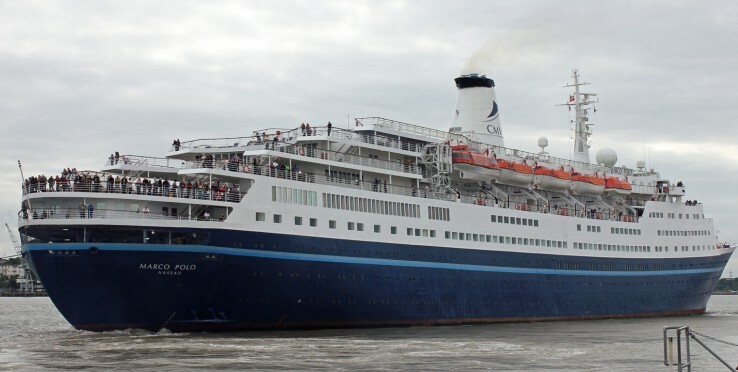 Being a ‘lady of a certain age’, Marco Polo has some of the quirky foibles of any liner converted into a cruise ship. Three main staircases provide access to most of the public areas and cabins. With blue painted wrought iron balustrades, they point up the entire Art Deco theme quite beautifully, but they do take a bit of getting used to. There is also a quartet of small, busy lifts but, truth be told, the ship is so charmingly compact that getting anywhere on board is hardly a trek. 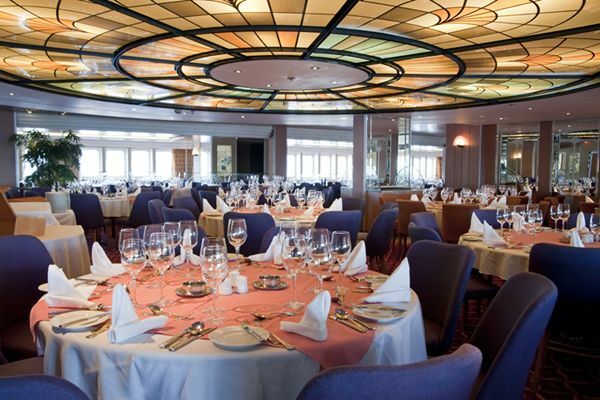 Down in the centre of the ship, the Waldorf Restaurant is the main dining room. With a flourish of floor-to-ceiling windows on each side and a beautiful, stained glass round ceiling as the centre point, the busy room serves breakfast and dinner in open seating and, as of our cruise, afternoon tea is also served here. Dinner is a traditional, two sitting affair, with menus tailored to the older British palate. There were two formal nights. On other evenings, the recommended code was jacket with or without tie, and the equivalent for the ladies. Buffet wise, the Lido is always busy. Table space, especially outside, is at a premium during lunchtime especially. That said, there are few things to match an al fresco breakfast deep in the snug splendour of a Norwegian fjord, with incredibly clear, sharp air and a side order of stunning scenery. 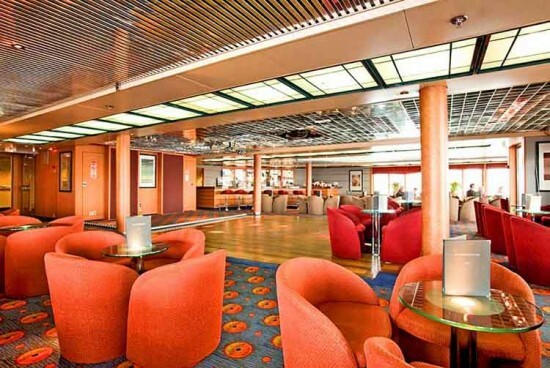 Inside, the main flow of public rooms runs from fore to aft on the central Magellan Deck. 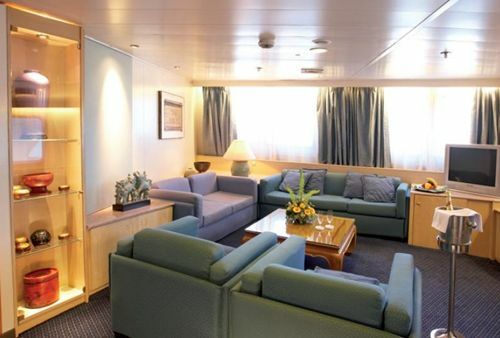 Right forward is the Marco Polo show lounge, spanning the full width of the ship. With a sit up bar at the far end of the room and a proscenium stage, this was the venue for nightly cabaret. The Captain’s Club is a nice venue for pre-dinner cocktails, and comes complete with a musical trio. Raffles is used mainly as a card and games room, while the lovely Columbus Club – formed from what was the casino – is adjacent to the Lido buffet. 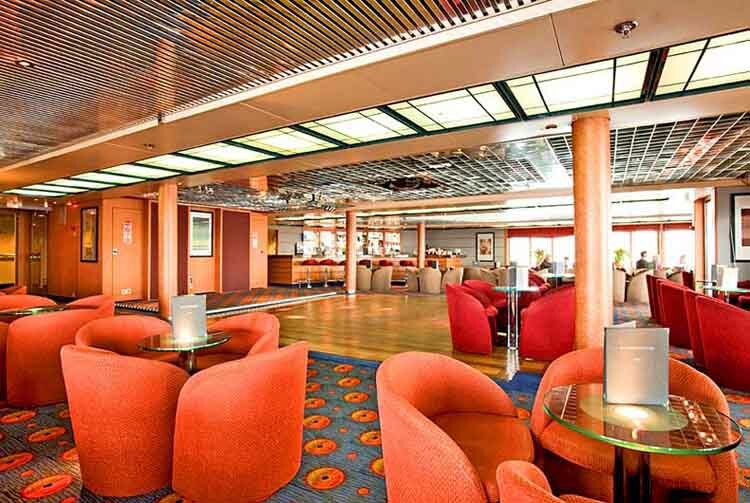 With comfortable seating and a secluded bar tucked into the corner, this is arguably the nicest part of the ship. One deck up, and right aft, Scott’s Club is the main after-dinner bar and lounge, hosting late night cabarets as well as the disco. But the crowning glory is the outdoor terrace, which seems to draw passengers like moths to a flame. From here, a series of stepped terraces form sinuous curves right down to the stern. Sprinkled with tables and chairs on real teak decks, it was a spellbinding vantage point from which to watch the pineshrouded Norwegian scenery slip by in the long light of a summer evening. There is also an upper deck gym. The upper deck hot tubs were especially popular during lazy days at sea; the deep hull of the Marco Polo shrugging off the long, rolling swells with almost effortless ease. If you need endless diversion, rock climbing walls and a casino the size of a zeppelin hangar, then the Marco Polo is not for you. Instead, you find a smart, well run ship that is traditional in style, and small enough to access the sweet, smaller ports that bigger ships have to pass by. Comfortable, welcoming, well fed and smartly served, the Marco Polo has charm, beauty, and more than a hint of sixties styling. A diminutive time capsule that takes you on two voyages at once; first, to a series of jaw-dropping ports of call, and secondly, back to a time when being at sea itself was considered more than enough to entertain. Real brass cabin keys, shuffleboard, and afternoon tea. They are all here. Celebrating her 50th anniversary next year, this stout, soulful little ship is a joy to know. Took his first cruise in 1981 and has written for The Scotsman, Independent, and The Sun, as well as a number of magazines. His voyages have taken in everything from ultra-luxury boutique vessels to the most modern mega-ships.